Flight attendant Amanda Amburgy recently proved that the simplest act of kindness can make a huge impact. ​​While Sonja Redding boarded her flight from Washington, D.C., to Atlanta, she braced herself for a stressful experience. Coming from a medical research trip for her two young children, she anxiously worked to keep them content for the sake of herself and everyone onboard. Both kids suffer from a rare genetic disease called Methylmalonic Acidemia, also known as MMA, for which there is no cure. While undergoing testing in D.C., her youngest, Xayvior, 5, was diagnosed with autism. About halfway through the flight, Xayvior began to fuss. Flight Attendant Amanda Amburgy's jump seat was just a few rows away. ​​"He was fine during boarding, but as soon as we took off his mood completely changed. I noticed he may have some trouble communicating his feelings," recalled Amanda, who volunteered with Special Olympics in high school. Xayvior continued screaming and soon began hitting his mom. "Traveling can be hard even without kids and I know moments like this can be even really stressful for parents," said Amanda. "I offered to take him up to the galley for a set of wings, which is my usual introduction when trying to calm down our younger passengers." Sonja handed her son over to Amanda. "I showed him the blue lights that were illuminated over the overhead bins on our way up to the front – he really liked those. I showed him all the other people onboard and he quietly looked all around." 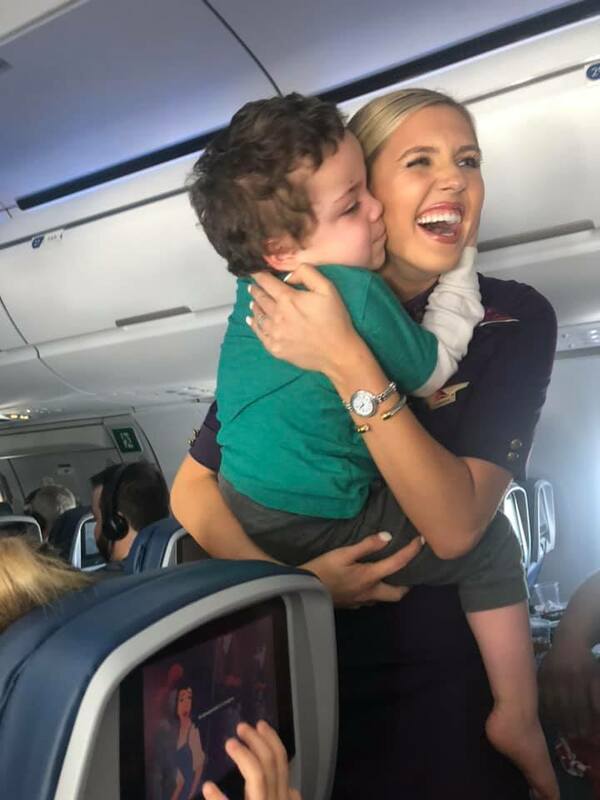 After a set of wings and a snack up in the forward galley, Amanda brought Xayvior back to his parents to begin beverage service when another customer a few rows away pressed the call button. "He flagged me over and told me that he has a 7-year-old son with autism and that his wife struggles when she travels with him. He said he's never seen a flight attendant do this and that he really appreciated it." Thankful for Amanda's kindness towards her son, she asked if she could snap a few photos of the duo – not knowing the she would take to social media to share her experience. Sonja shared her experience in a Facebook post, praising Amanda's kindness. Through the power of social media, Sonja was able to connect with Amanda to express her gratitude. Surprised by the overwhelming response, Amanda hopes the message can help shift people's mindsets when they travel. "People don't always understand that their normal isn't everyone else's normal. This is this family's normal." Allison Ausband – Senior Vice President of In-Flight Service, praised Amanda's kindness. "This exemplifies the Delta difference in every way. Service from the heart is what we're all about and I'd like to thank Amanda and Delta employees around the globe for showing thoughtful service like this to the world."